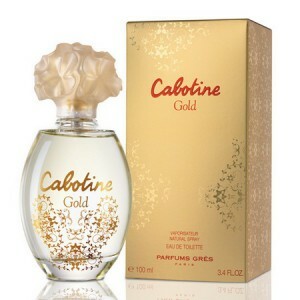 Cabotine Gold 100ml. Eau De Toilette fragrance betrays atmosphere prevailing during the Carnival in Brazil. First associations that arise in this sense of smell - it's bright gold ornaments that display all the luxury celebration. Music composition created from red pepper, melon and tangerine. In the heart of the fragrance opens up a delicate peony, jasmine, tiare flower. Playing perfect final touch of flavor steel vetiver, amber and patchouli. This new fragrance was introduced in 2010. Simultaneously innocent and provocative fragrance was created by perfumer Vincent Schaller talented. Warm oriental fragrance Gres Cabotine Gold concluded in the original vial, which is crowned by a cap, designed as a flower bud disclose. Who likes flavors from Gres, can offer toilet water Ambre de Cabochard with oriental undertones. Eau de Toilette Gres Cabotine Gold opens with sweet spicy notes of ginger and cinnamon, green cardamom and black currant. In the heart of the fragrance notes are stored Mexican tuberose, cyclamen and lily of the valley. Cabotine Gold ends fragrance daisy-musk and patchouli leaves, amber and tonka bean, which is conveniently located on the background of mitigating woody notes. citrus floral fragrance in a limited edition, elegant, exclusive and attractive, dedicated to luxury and beauty of gold. Tangerine, melon and pink pepper create a hot and sunny fragrance disclosure. Heart characterized by sensuality of white flowers, soothing and magical. Fresh flower Tahitian gardenia blended with peony and jasmine. Dry base notes include soft Bourbon vanilla, vetiver, amber and exotic patchouli. Cabotine Gold created by perfumer Vincent Schaller of Firmenich in 2010.